HEWLETT & MARTIN. 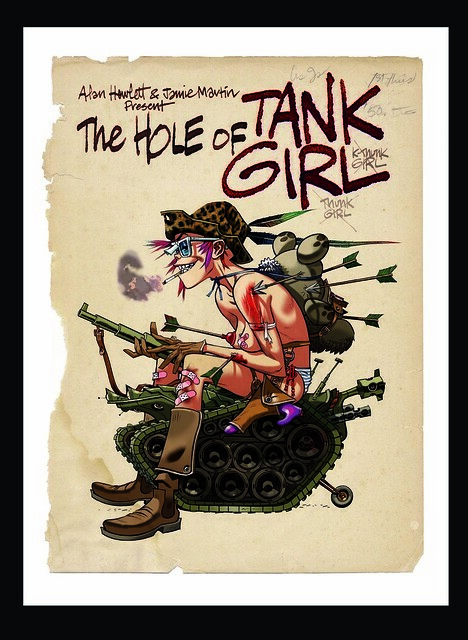 THE HOLE OF TANK GIRL. World release day 18th September. Advance copies will be available at the San Diego Comic Convention in July. Everything we’ve ever done, and then some, presented in pristine, recovered, repaired, and remastered large format. Hard cover, slipcase, over 30 pages of unseen archive material, first 2,000 copies hand signed on a bound-in parchment page by yours truly, and a glorious cover of a more “mature” looking Tank Girl by Jamie. More details soon. You’re going to sign 2000 copies? ouch! Alan Hewlett & Jamie Martin? Any chance of either you or Jamie making it to San Diego to sign copies?